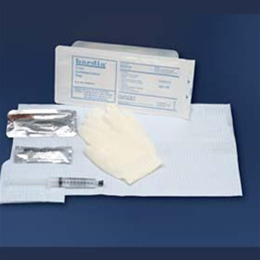 Waterproof underpad, fenestrated drape, 5g lubricating jelly, 2 latex-free exam gloves, specimen container with label or graduated collection container. 3 Povidone iodine or 3 BZK swabsticks. CSR-wrap package or Peel-top package. Single-use, sterile.